Join us for the recordings of four all-new -- and duck-poop-free, I hope -- episodes of "The Petcast" Saturday morning at LVRocks.Com. You can call in and ask questions of our guests at 702-383-8120 as well. 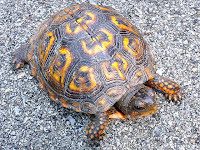 9 a.m.: Dayna Rich does intake evaluations and cares for animals at the Colorado Reptile Human Society, a statewide shelter for reptiles and amphibians in Longmont, Colo. She'll talk about how it is that these pets get abandoned and what misconceptions lead people to buy them in the first place, plus proper care for reptile pets. 9:30 a.m.: Marlena Cervantes, owner of Flexpetz, dubbed as "a new concept for dog lovers with busy lifestyles." For a monthly $39.95 fee plus a per-day fee, people can rent dogs from centers in San Diego and Los Angeles with plans to expand to New York, San Francisco, London, Boston and Washington D.C. She explains the service, which in some ways harks back to our show No. 44 in which Ed Nicholas talked about sharing custody of his dog, Buddy, with his ex-partner. 10 a.m.: Ben Huh, founder of Itchmo.com, a wildly popular blog site that became quite important when the pet-food recall emerged. Huh and his wife, Emily, operate Itchmo Pets Network, a collection of sites that also includes CatStuffReviews.Com and DogStuffReviews.com. 10:30 a.m.: In studio guests are David Pohl, Keith Brown and their dog Devon, a McNab they adopted after he was mistreated by his first owner. They'll talk about that as well as flyball. Their team is called Fly N Aces and the site is www.flynaces.com. It was such a chore to use the Fisher Price Mac that I did only the bare minimum of what I needed to in order to get through my work week. 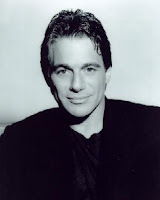 That meant waiting until last night to post our episode with Tony Danza as blogging much. I also posted in the feed the 20-minute chat I had on KNPR in Las Vegas about my book. You can hear that here or right-click here and download it to hear whenever you wish. Oddly, I went to the Mac store Tuesday to pick up my duck-pooped MacBook Pro and when I tested it out, the X and C were working but the o, l, 9 and . keys were suddenly not. And they were FAR from the site of the duck incident, so that's weird. They took the machine back for another day, replaced the logic board and some other stuff and now it all seems A-OK. Anyhow, today's a really busy day that has already included an hourlong chat with a cartooning hero of mine, Lynn Johnston of "For Better or For Worse." I'm also finishing a fun feature for Vegas mag about the legendary Piero's restaurant, the old mob hangout. Yet the big news is that I'll be chatting with STEVE WYNN at 2:30ish today for a few stories I've got in the works and will see if I can use it on the podcast as well. Tomorrow morning is busy for my vocal chords. Most importantly, I'm scheduled to appear on KNPR (88.9 FM) with Dave Berns on his State of Nevada show live at 10 a.m. PT and then rebroadcast at 8 p.m. PT. I believe all of it is live-streamed on KNPR.org. Topic du jour is my book, "Gay Vegas." You might've heard me mention it here or there. But first...After we record "The Strip" tonight, I've got to get to bed early tonight because I'm due to appear on a morning drive-time talk show in Baltimore on WWLG, 1370 AM, at the ungodly hour of 5:40 a.m. PT to chat with host Michael Gabel about the piece on placenta-munching I did for USA Today in July. So if any of you out there are in that area at 8:40 a.m., tune in. I'll be on for about five minutes, which is about how long it takes us on "The Strip" just to give out our contact info. Let's see if this is an ew-how-gross conversation or a isnt-this-curious one? I admit, I've blogged and written both ways on the matter. I can't imagine a radio host will be able to resist mock-vomiting. Join us in the live chat starting at 7:05 pm PT at LVRocks.com as Tony Danza describes the time Frank Sinatra yelled at him on national TV and explains why his "Who's The Boss?" co-star Alyssa Milano did not turn out like Britney Spears. Plus, news from Vegas, the poll, trivia, the tourist tip and more. The podcast will be up on Thursday as always. I wrote this piece for Sunday's Chicago Tribune on the big chip collectors confab in Vegas, which was terrific fun to cover. I went in thinking, "These people are gonna be nuts" and I left totally getting it. In fact, I'm going to edit down a charming interview I did with a couple of these folks and put it out on "The Strip" podcast feed as an extra. Here are some pix of the intriguing non-chip stuff people brought to show, trade and sell. I also, of course, bought a little something. OK, two things. The first is this fantastic music box (pictured below) from the 1991 opening of the Stardust tower. It even plays "Stardust." I grabbed it for my mom, who collects music boxes, but I think I may keep it. The amazing part was that the seller had wanted to sell it for $25 and started a silent auction with bidding beginning at $5. It was too silent. When I came along his deadline had passed and he let me have it for $5!!! My other treasure was a June 1955 Life Magazine that is constantly referenced whenever people ask if Vegas is hitting its outer limits of growth. 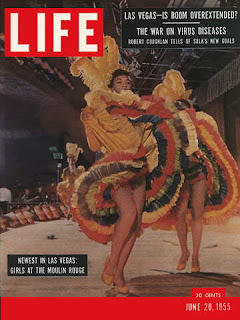 The main art is of a Moulin Rouge showgirl but in the upper right corner of the cover was the headline "Las Vegas - Is Boom Overextended?" That was 52 years ago. The guy had five of them, each going for $25. I bought three, including one for the LVRocks.Com studio and one for an as-yet-determined friend or professional contact. I'll sit down to read the stories later and let you know what I uncover.